SAN DIEGO, July 18, 2017 /PRNewswire/ -- Bridgepoint Education, Inc. (NYSE: BPI) today announced it has made the list of the top 25 organizations who participated in Red Shoe Day and collected donations for Ronald McDonald House Charities® of San Diego. Held Thursday, June 22, 2017, the Red Shoe Day event was participated by 27 Bridgepoint employees who collected money in Ronald McDonald's iconic red boot. This is the second year Bridgepoint ranked in Red Shoe Day's top 25 list of donations collected by an organization. Started in 2009, Red Shoe Day was created to help raise money for San Diego's Ronald McDonald House. The Ronald McDonald House provides a "home-away-from-home" for families with children being treated for serious, often life-threatening conditions at local hospitals. 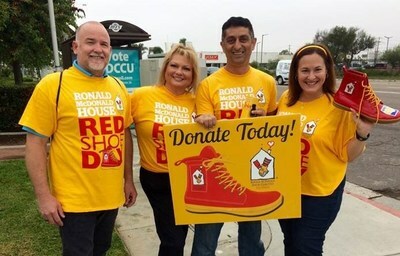 During Red Shoe Day, volunteers collect donations from commuters and passers-by throughout San Diego County, and all proceeds support family care at San Diego's Ronald McDonald House. "The Ronald McDonald House provides such valuable support to San Diego families with children requiring hospital care for serious illness," said Jennifer Love Bruce, vice president of corporate social responsibility for Bridgepoint. "Our employees really care about giving back to the community and we are grateful that we could come together and help support Red Shoe Day." For more information on Ronald McDonald House Charities of San Diego and Red Shoe Day, visit www.rmhcsd.org/.